This version is the Notrium Steam Special Surprise Edition. It includes many improvements including achievements, cloud saves, autosaves, combination hints for easier levels, and to top it all, a surprise! Scavenge enough food and supplies to survive through the cold, dark nights. Explore the alien ruins and bases to find parts for weapons and equipment. Shoot, sneak, and think quickly. Lure the aliens to fight the marines. Choose from four playable characters, each with different strategies and abilities. Notrium has six possible endings, but can you reach any of them? 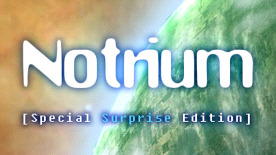 Notrium was originally released in 2003 when it was regarded as one of the finest examples of the budding indie game movement. It had a fan following of millions, with dozens of mods, and multiple clone games. Notrium was one of the first survival games ever made, and possibly even the first ever to be called a survival game.